You don’t know fishing until you have been to the White Marlin Open in Ocean City Maryland. Six figure boats dock from all over the United States to participate in this fishing tournament. Sunset Grille is the docking venue for boats for the White Marlin Open. This is a restaurant that has a breathtaking view of the water, and some of the best seafood that I have ever tasted. If you are not a seafood finatic, there are plenty of other dishes to choose from on the menu. I got the shrimp and lobster salad which was five stars. We all also ordered the “Painkiller” cocktail. This is the tall and thin cup featured in the photos. If you were experiencing any real pain, this cocktail sure would take the pain away quickly. It is made with coconut rum, spiced rum, fresh orange juice, pineapple, and coconut cream. Registration for boats starts at $1,050 for the early birds, and goes up to $1,400 after that. Although the fee is on the expensive side, the return on investment can be astronomical. Over $2.5 million dollars has been given to the winner. The average weight of a white marlin can range anywhere from 60 pounds to 160 pounds according to Big Water Adventures. The bigger the marlin, the more dollar signs that will be added to your check in the end of the rankings. At the end of the day, whether you have the nicest boat or the oldest one it all comes down to who gets to the Marlin first. Who took the winning check home this August? It was Pascual Jimenez from Puerto Aventuras, Mexico. His winnings totalled exactly $2,584,260 for a 83 pound Marlin. Bethany Durst in the pineapple dress in the middle is originally from Maryland, and her Mom recently moved to Ocean City full time! 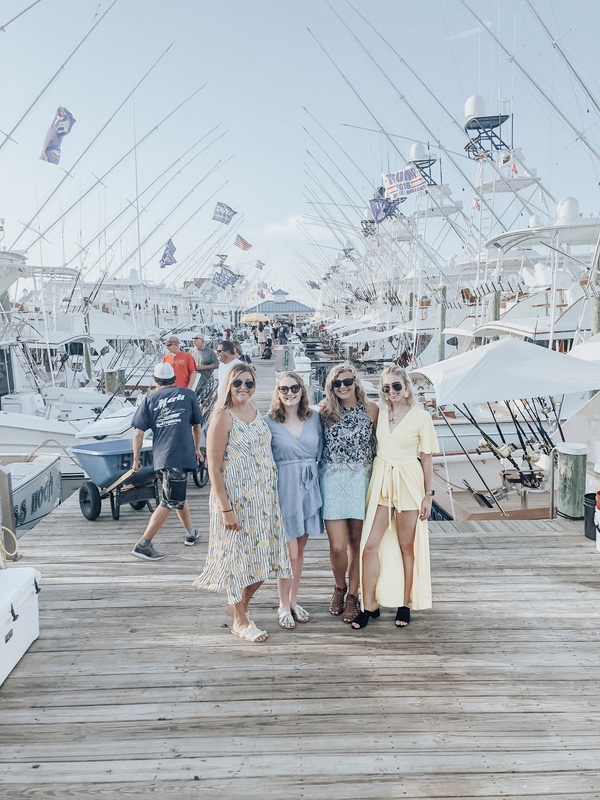 Bethany grew up coming here all the time, and it is a family tradition to see the White Marlin Open. This Romper with a caped back is from Mandee. Their best location product wise that I have been to is in Herald Square. I wanted to keep the yellow theme going with these fun paper and jeweled statement earrings from Express. I wore black wedges to keep msyelf comfortable with a little heel.